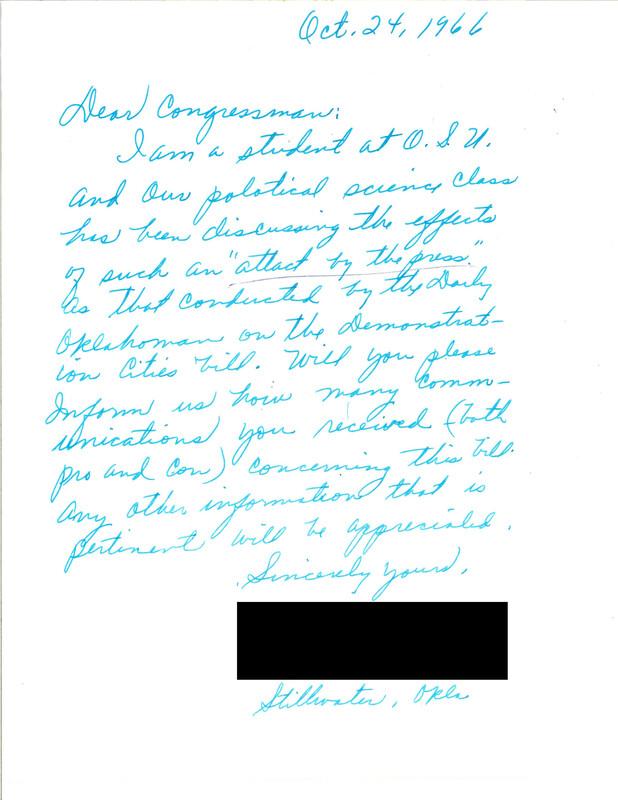 A letter to Speaker Carl Albert's office from a political science student at Oklahoma State University requesting data on constituent correspondence concerning a series of editorials in the Daily Oklahoman which urged Oklahoma voters to oppose the Demostration Cities and Metropolitican Development Act. Includes Ablert's staff's response with estimates. Carl Albert, 1910-1998. "Letter from Oklahoma State University student and office response." Carl Albert Collection, Legislative, Box 82, Folder 87, Carl Albert Center Congressional Archives, University of Oklahoma. Accessed 19 April 2019. http://acsc.lib.udel.edu/items/show/466.